Part of my involvement with the Association of Certified Fraud Examiners (ACFE) annual conference is providing personal career consultations with conference attendees. Many attendees work in the public sector, and over the course of individual conversations with folks who signed up for personal consultations, I was surprised to learn that many of them have no active involvement with social media platforms. Many believed they had to fully immerse themselves on a variety of platforms, but were relieved to know that that’s not the case at all. Some have Facebook pages, and some have LinkedIn profiles, but in most instances, either their LinkedIn profiles are incomplete, or they simply have a presence and are not actively participating – or both. An active social media presence makes you more visible to decision makers and hiring managers. Social media has rendered organizational “gatekeepers” obsolete, because with an active social media presence on the right platforms, you can gain access to these people. Without an active social media presence, you are anonymous. Some studies show that between 33 and 67 percent of all positions filled come about through referrals. That’s justification enough for you to continue building your network of contacts on LinkedIn. Social media (more precisely, networking platforms) allows you to promote and leverage your expertise as a resource for others. Hiring managers are always looking for problem solvers, game changers, and solutions providers. And all hiring managers want experts on their team. Social media connections allow you to build a level of mutual familiarity. One of the first steps to gaining access to decision makers is to first establish a degree of mutual familiarity. Make your connections strategic for any potential mutual exchange of value. Familiarity with your network contacts over time leads to trust. When you consistently contribute value to conversations with others, “like” their comments, or “retweet” their Tweets, that familiarity can lead to mutual trust. Mutual trust with your network contacts can lead to direct access. Hiring managers, like the rest of us, want to work with people we are familiar with and who we trust. More often than not, those people advance to the head of the line for direct access. What accelerates direct access to decision makers is having a polished professional brand that makes its way onto social media platforms through your website, blog, articles published in peer-reviewed journals, books, conference presentations, and so on. All of that goes in your LinkedIn profile. I cover building a professional brand in both of my books. As i mentioned, there’s no need to be active on a wide variety of social media platforms – only a couple where decision makers are active will be sufficient. Besides this blog and my website, I am active on LinkedIn and Twitter. My business Facebook page automatically receives feeds from my blog posts and Twitter activity. I limit 98% of my posts to issues surrounding job and career strategies. ACCOMPLISHMENT! What are your ruby slippers? My name is Donn LeVie Jr. and I’m a former hiring manager for Fortune 500 companies (Phillips Petroleum, Motorola, Intel Corporation, and others) and have worked in the federal government (NOAA) and in academia as an adjunct faculty lecturer in the Department of Natural Sciences and Mathematics for the University of Houston (Downtown Campus). I am the author of Strategic Career Engagement(September 2015), Runner-Up of the 2016 International Book Award for Business: Careers, and the book that reset the rules for successful job and career strategies: Confessions of a Hiring Manager Rev. 2.0 (June 2012, Winner of the 2012 Global eBook Award and Winner of the 2012 International Book Award for Jobs/Careers). I lead career strategy seminars at conferences, business/trade schools, colleges and universities, and U.S. military veterans organizations. I also offer a Career Engagement Evaluation subscription program to associations as a member benefit. Does your conference need a keynote speaker or a career strategies seminar for conference attendees? My 2017 engagement calendar is starting to fill up…contact me directly at donnlevie@austin.rr.com for more information or use the Contact page on this blog. Don’t miss out on my blog posts…follow me now on Twitter @donnlevie. LinkedIn Referrals: Released in November of 2015, this tool identifies participating employees’ first-degree LinkedIn connections who match the criteria for open jobs at the employees’ companies. Those who sign up will be able to see which of their connections are good matches for jobs on the company’s LinkedIn Referrals page. They can also send out job posts and share them through status updates. Cost to organizations: $10 to $12 per worker annually. LinkedIn Recruiter: The next version of this tool will be available Spring 2016 and will be a free upgrade for current users. This tool has a user interface that is designed to help anyone find candidates using an existing employee’s profile, to create and modify search strings, and to sift through talent pools to differentiate talent using a variety of customized subsets. The tool will also show the terms it used to build the search string and allow users to modify the search. Spotlights: Talent pools can be further subdivided using Spotlights, which will take members who already fit the search string results and break them down into various subsets, including people who have engaged with the company brand on LinkedIn and candidates who have previously applied for jobs at the company. Let’s look at a couple implications these tools offer for candidates. Second, by understanding how these advanced features can be used by paid LinkedIn subscribers, candidates can outline a strategy that places their expertise in ways that increase the odds of ending up on a recruiter or hiring manager’s short list for open positions (positively engaging with the company brand, for example, may be one additional filter your candidacy passes through to be considered further). About once a year, I go through a purge of my professional networks. I do it more often with social media networks as “friends” drop off the radar, or some posts from friends/acquaintances are nothing but hyper-political rants (I plead guilty to the occasional rant myself), age-old video retreads, or just offensive content. But professional networks represent (or should) a different collection of individuals who are trusted contacts where you can exchange ideas, job leads, and other opportunities. Not everyone you know or have known should get in to your networks (a policy I embrace). The quality of your network is tied directly to the quality of the professionals in it. Here are 10 reasons to purge your professional network on a regular basis. The decision for who you select for your network (other trusted professionals) should be grounded in your overall network (LinkedIn, Twitter, others) and career strategy. Your definition of “trusted professional” may change over time as many in your network seek to help others first, while some seem to always seek help from others first. I receive a number of requests on a daily basis from people I do not know to join my LinkedIn network. If they are members of a client organization which subscribes to my career strategy services, seminars, or consulting, I generally accept the request after reviewing their profile. Your first-degree connections usually are with people already in your offline network that you’ve known since “pre-network” days. They are the first layer of your multidimensional network. You can have too many first-degree connections, but you can’t have too many trusted first-degree connections. You aren’t trying to be the Ashton Kutcher of LinkedIn, because that’s not the purpose of professional networks. Trusted first-degree connections are those folks who can facilitate introductions and connections to others in their networks. Remove contacts who may not be able to assist here. Review your participation in network discussion groups; you want your participation in those groups to reflect your current career and professional interests. When those change, think about dropping those discussion groups that are no longer pertinent and joining others that now are. Review your endorsements and recommendations to determine if they reflect your current career position; if not, remove them. Purge (or reprioritize) any stale skills in the endorsements as well. Review any documents, photos, presentations you may have in your chosen professional network to ensure they still reflect your current career position; if not, delete or update them as necessary. Rethink keywords used in your profile that others may search on and ensure those keywords remain current and germane to your current or future career strategy. Be sure to purge dead links to blogs, YouTube videos, websites and ensure the active links provide helpful information for others. Be seen as a resource for others first, and others will gladly return the favor. For your professional network to function like a well-oiled “reciprocal opportunity machine,” it will require two important components: your finely tuned expertise (skills, knowledge, experience and accomplishments), and the quality of those unique trusted relationships in that network. There’s only one slight problem: I don’t know anyone named “I.M. Clueless.” If I don’t know Mr./Ms. Clueless, why on earth would I endorse or recommend this person or his or her work? I.M. Cluless may be a hacker or embezzler for all I know, and by endorsing an individual with whom I am not familiar, I stand to tarnish my own professional reputation. Guilt by association. I know many other professionals have been exposed to such mindless desperation through LinkedIn and other professional networking sites, so what’s the best way to work an endorsement or recommendation? Clueless could have started by giving me a recommendation first, if Clueless thought I deserved one. It’s always better to offer something before asking for something. If it was important to Clueless that we connect, Clueless could have attempted to meet me first, if it was convenient. Clueless could have commented on my blog posts (hint, hint) or notes on my LinkedIn profile. This would have been noticed and appreciated. Clueless could have sent me an email expressing appreciation for my work or find some other way of making a personal connection first through any number of activities that don’t ask for anything in return and don’t make any assumptions. It’s not just a matter of knowing who you are; I need to know something about your work–maybe even your brand–before I can consider offering an endorsement. 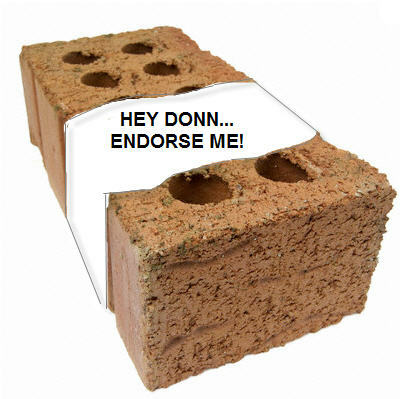 And use those bricks instead to build your platform of expertise, knowledge, and professional brand.